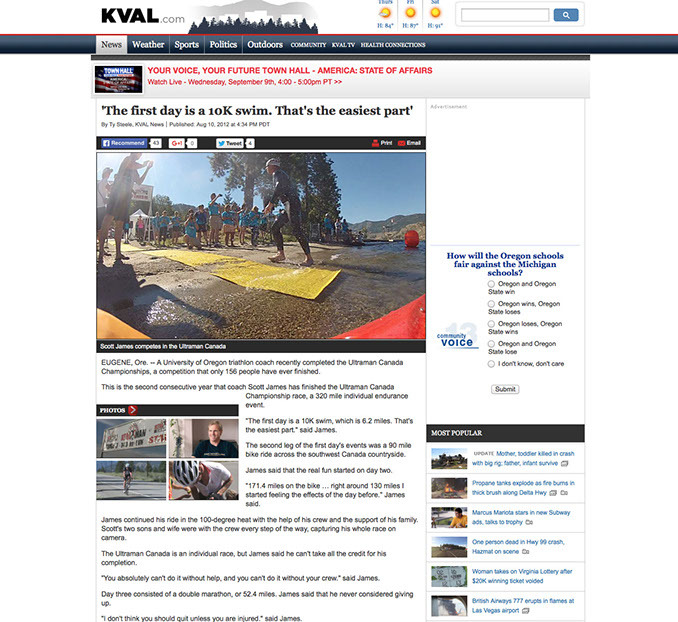 August 10, 2010 KVAL news story following Ultraman Canada 2010. Scott James has completed nine Ironman triathlons, and he’s still in search of what he calls the perfect race. In an Ironman, those pieces include a 2.4-mile open water swim, 112 miles on a bicycle, capped off with a 26.2 mile run. Competitors start at 7 a.m. and have until midnight — 17 hours later — to finish. James, 42, first started doing triathlons when he was attending Newberg High School in the 1980s, when the races were first getting started. After a long break from the sport, he decided to take on the Ironman challenge after completing the Las Vegas Marathon in 2000. He tried to race Ironman Canada in 2001, but he couldn’t get in, so he drove up to Penticton, B.C., anyway to watch the race and sign up for the next year’s race. In 2002, he finished in 11 hours, 32 minutes. He’s gone faster, but he’s yet to break 11:30. “I’m the most consistent Ironman in the southern Willamette Valley in the last decade,” he said. James coached the University of Oregon triathlon club for four years and recently started a private triathlon coaching business (see his Web site: eugenetriathloncoaching.com). Although there’s only seven days in a week, James swims three to four days a week, runs four days a week, and bikes three to four days a week. He does shorter workouts during the week, saving the long rides, runs and swims for the weekend. James does some core exercises but doesn’t do a lot of weight training. He does sport-specific strength training, such as intervals. “The idea of endurance sports and specifically Ironman events is not adapting the body’s ability to endure pain, but to endure work,” he said. James said he’s not especially careful with what he eats until he starts getting closer to an event. “Because of the amount of exercise I do, what I eat during my workout and for recovery and during the day will effect my workouts later in the week,” he said. “I have to be careful I eat enough carbohydrates,” particularly complex carbs. The night before a race, he used to eat pasta; now he eats pizza. During a race, he consumes carbohydrate-rich electrolyte drinks and energy gels. Early in the bike ride, he’ll eat a couple of Snickers bars. As the day progresses and it gets hotter, it gets harder to keep anything down. So he drinks flat cola offered at aid stations and eats gels. James spends $60 a month on a masters swimming membership at Willamalane Park and Recreation District. He buys a wetsuit every three or four years. He has a few pairs of tri shorts and tri tops. His big investment was the recent purchase of a Specialized S Works Transition time trial bike, which retails for $7,700. “When it’s crunch time, like getting close to a race, and you maybe don’t want to do it because you’re tired, you force yourself to go,” he said. When first-timers complain about fatigue during training, he said, veterans like to say: Get used to it. “My Workout” runs periodically in Monday’s Oregon Life section. If you’d like to see your workout profiled, or suggest someone else’s, send an e-mail to myworkout@registerguard.com.